You are already known in your city as a talented pizzaïolo, the pizzas vending machine PIZZADOOR will emphasize your pizzas and your work. To get a faithful, family customer, you will have to prepare delicious and high-quality pizzas. Rich, copious, your pizzas are recognized as being the most flavorful regard to all those available near your vending machine. Warm, crunchy and tasty regular customers will move for your pizzas. Visible, easy to park around, close to residence and\or employment places, your premises or kiosk including the machine must be chosen carefully to establish faithful and recurring customers. Municipalities from 2.000 up to 10.000 inhabitants collect all chances of success considering their density of population and the absence of pizzas channels with late delivery schedules. 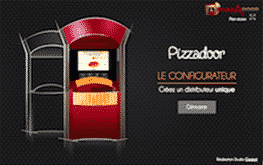 The look of the PIZZADOOR distributor must be perfect to attract and develop loyalty of new customers. The cleanliness of the place and the distributor, attractive photos of your pizzas, a clear machine labeling system will also contribute to the success of your sales. An analysis of customers profile aimed on your sales area will allow you to set up adapted actions of communication and promotion. Flyers, tasting in front of the machine are promotional actions with immediate success. From home, your ADAIL operating software will allow you to know the state of your stock of pizzas in cold room, their age and to activate if need be promotions, offers of development of customer loyalty. Regularly renewed, your pizzas menu changes according to seasons to instigate the curiosity and generate new customers. An offer of about ten different and tasty pizzas satisfies a wide clientele.